Take a Mojito Cocktail to the next level with strawberries! I love a good strawberry cocktail and this Strawberry Mojito is so fresh tasting and delicious! You will love the strawberry mint combination! When all of the glorious fruits of spring and summer start appearing at the Farmer’s market and at the grocery store, my head doesn’t go to baked goods. No strawberry shortcakes, no blueberry tarts, no rhubarb pies. My mind heads to cocktails. There is just something about fruity cocktails that makes me so happy. First of all fruity mixed drinks are delicious! Fruit is an easy way to take a basic cocktail to the next level. They add color, sweetness and flavor. Plus their good for you, which makes the cocktails good for you, or at least that’s my story and I’m sticking to it. Like today’s Strawberry Mojito. I love a regular mojito. That combination of rum and mint, soooo good. But add some strawberries to it, and you’ve created a perfectly balanced and oh-so-pretty cocktail. Let’s talk about how to make a mojito. The first question you have to ask yourself is do you want to use a cocktail shaker or not. Some people are adamant that the cocktail be made in the glass, with the mint muddled right in the glass. Other people, muddle in a cocktail shaker and strain into a glass. I’ve done it both ways and have decided I like the cocktail shaker version best. I don’t like having bits of muddled mint in my glass. It’s a personal preference. You can try both ways and decide which way you like it the best. I’m showing the steps using a cocktail shaker. Step 1 – gather your ingredients: white rum, fresh squeezed lime juice, simple syrup (equal parts water and sugar, heated over medium heat until the sugar dissolves) and sparkling water. Note – for sparkling water, we use our Soda Stream. Step 2 – in a cocktail shaker add the rum, strawberries and the mint. Muddle until the mint and strawberries are broken down and have released their flavor to the rum. Step 3 – add the simple syrup and lime juice to the rum. 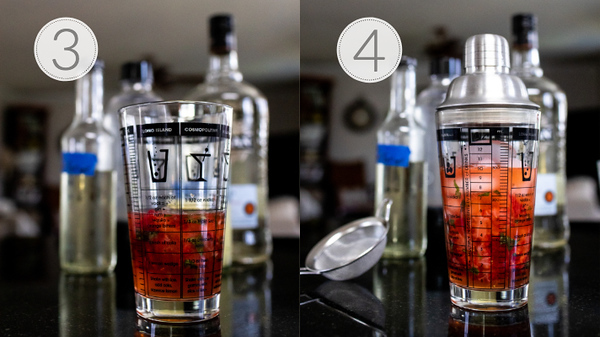 Step 4 – add ice cubes to the cocktail shaker, and shake for about 20 seconds. Strain using a fine mesh strainer into a cocktail glass filled with ice. Top with sparkling water. Have you noticed that things that grow at the same time go so well together? Right when strawberries start showing up, my mint is beginning to flourish. As soon as I see my mint popping up from the cold spring ground, I start envisioning all the yummy mojitos in my future. They really are the perfect spring and summer cocktail and top the list of my favorite rum cocktails. So delicious and refreshing. Mojitos are a classic cocktail from Cuba and I always think of Hemingway when I drink mojitos. You can read More About Mojitos at Wikipedia, lots of interesting trivia and facts! A little sweet, a little tart and rounded out with fresh mint. perfect! If you’d love to see some more rum cocktails – be sure and follow my Rum Cocktails Board on Pinterest. 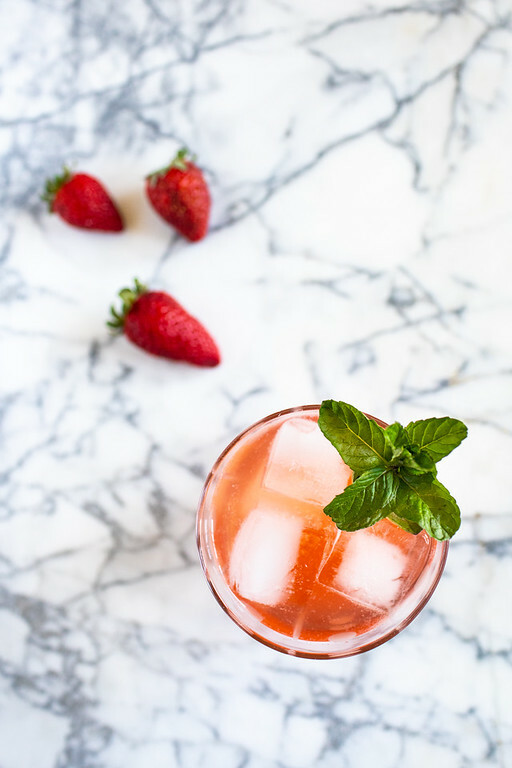 This Strawberry Mojito is an easy and refreshing summer cocktail that combines red ripe strawberries with fresh mint! 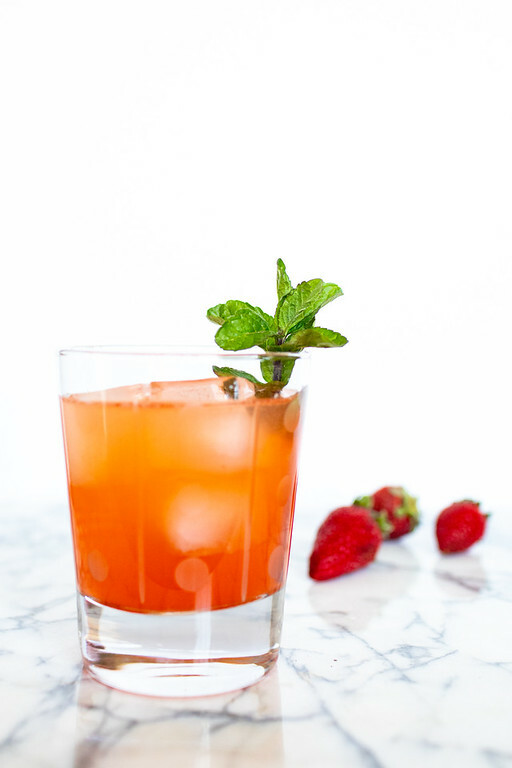 In a chilled 12 ounce glass or a cocktail shaker, add the rum and the strawberries and mint. 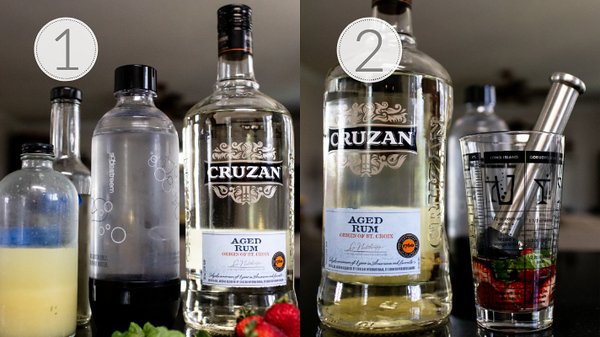 Muddle the rum with the strawberries and mint until the strawberries and mint have broken down and flavored the rum. Add the lime juice and simple syrup. Add ice to the cocktail shaker or the glass. if using a cocktail shaker, add the lid and shake for about 15 seconds and then strain into a cocktail glass filled with ice. Top with the sparkling water and stir. Always use fresh squeezed lime juice, not bottled. We squeeze a few limes at the beginning of the week to use for cocktails (and cooking) through the week. Instructions are given for either using a cocktail shaker or preparing the mojito right in the cocktail glass. Try both and see what your preference is. Simple syrup - equal parts water and sugar heated over medium heat until sugar dissolves. Store in the fridge for up to a month. Update notes: Originally published May 2015, updated for 2019. It’s such a refreshing drink for summers, love it. Wow, your mojito was so delicious! I’ll definitely be making this again as it starts to warm up! It’s perfect for warm weather! OMG I suddenly got so thirsty! This looks so amazing and refreshing! Making one this weekend. Strawberry and mint combo sounds so refreshing!! Simple, easy to make and perfect drink to enjoy this summer. Yes! Bring on Strawberry season! I never had a strawberry mojito before. This sounds so interesting & looks absolutely refreshing. Will give it a try asap. This looks so good! I have an invasive patch of mint in my back yard that I’ll definitely be putting to work! Cocktails for days!